Saturday 6th – Monday 22nd: Easter holidays, Open from 10am daily. 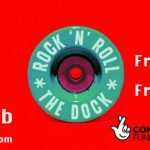 Wednesday 17th April: Farewell JP Skate Jam, Mini skateboard jam to say goodbye to JP. Doors open 5pm. Regular entry prices. Saturday 27th April: FDT Battle Royale Event, Doors open at 7.30pm. Regular skatepark sessions end at 7pm. 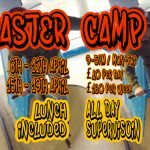 And we have our Easter Camp running Monday to Friday both weeks of the holidays. Check out details here.